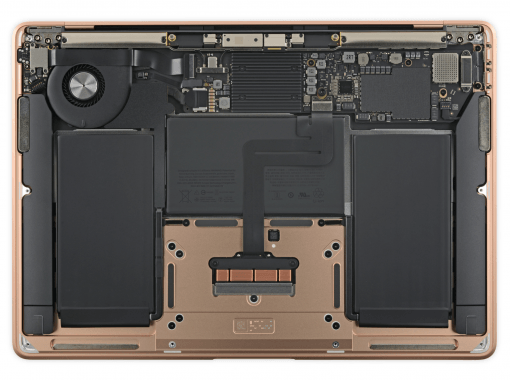 fixit gave us the pleasure to take the new MacBook Air 2018 apart: As it looks, Apple is only somewhat referring to sustainability. For example, the battery is glued again, but with easily removable adhesive strips similar to those in the iPhone. So changing the battery won’t be a battle, it can be done easily. In addition, the individual cells are held together by a frame, just like in the old Air. Apple thus seems to move away from completely sticking the batteries together. Maybe the exchange including topcase and keyboard was simply too expensive in warranty cases. The Touch ID Sensor is also designed separately: it can be changed independently of the keyboard, and the trackpad is also easy to replace. Interesting detail in the cooling system: the device has a fan and the CPU is located under a heat sink, but both are not connected by a heatpipe as in conventional models. Apparently, the airflow generated by the fan is sufficient to cool the processor – which is probably also made possible by the very flat design. All photos and even more details can be found as usual at ifixit.